Grazhopper, Parajet, Fly Products, Miniplane, Yooda, Scout, Air Conception, Propulse. Macpara, Dudek, Ozone, Apco, Gin, Sky, Gradient. 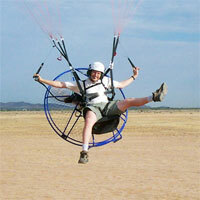 Airparamo LLC offers paramotor, powered paraglider or PPG flight instruction, service, and products. Located south of Phoenix, Arizona, our award winning instructor, Mo Sheldon, offers full-time, year-round service to suit your needs.